If you want a no-hassle, easy to use VPN client, then PureVPN is the way to go! PureVPN makes using a VPN so simple that you often might forget you are using a VPN at all. With more than 40 servers all over the world, you are certain to find a location that works fast and consistent no matter where you are. PureVPN can be purchased for $4.16 a month if you buy the annual subscription or $9.95 if you buy just a single month. With over 50% savings for an annual subscription, it is definitely worth the purchase if you need anything other than a temporary VPN solution. PureVPN's website is extensive and informative. There is a knowlegebase for any question you may have and tutorials for virtually all hardware and software. 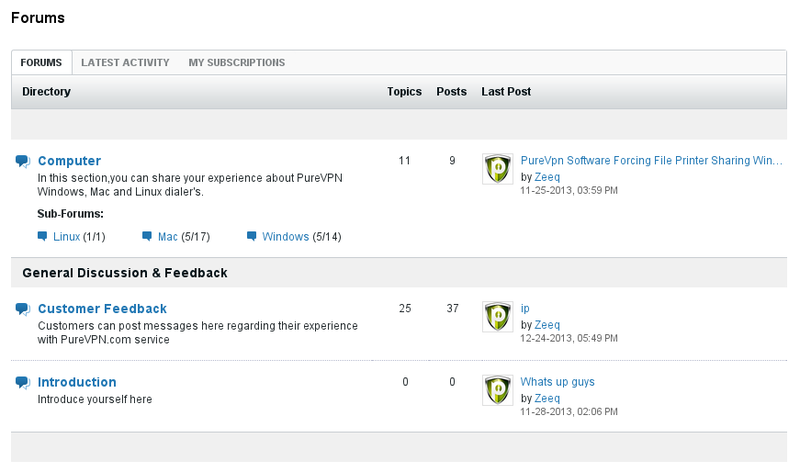 PureVPN offers 24/7 customer service via email, support ticket, or live chat. My experience with support has been wonderful. I never had to wait for more than an hour or two to get my questions answered and resolved. If you can't get an answer through the knowlegebase or technical support, you can also try your luck in the forum. On PureVPN's website, I counted more than 40 server locations from various places around the world (I have been informed that there are 300+ servers in 26 locations specifically). To make connecting easier, they offer software that enables you to quickly change servers and connect automatically. The software is available for Window, Mac, Android, and ios. One thing that seemed to excel with the PureVPN service is when I used it with my DD-Wrt router. I saw that there was a tutorial for it on the website so I decided to give it a try. It worked! Once I had my router logged into PureVPN, I never had to worry about connecting again. I stayed connected to PureVPN 24/7. Fantastic price if you buy a yearly subscription. Support for OpenVPN along with PPTP, L2TP/IPSec, SSTP and IKEv2. Offers free software for connecting. Many different servers all over the world. Offers 3 day money back guarantee. Server list was difficult for me to find (I had to access my email every time as I could not find the list on the website even after I was logged in). The core value of Purevpn is Quality, Freedom, Choice of Connectivity ... you provided a great details in this Purevpn Review and its ease to use.. I signed up to pureVPN for a year and right from the start I was having problems and support was no help, so I decided to leave within the three days so I could get my money back. Till this day I have not received my money back and it looks like I never will. Stay away from this company like the plague; they will take your money and give you a service that is un-usable. I have been with PureVPN for nearly 15 months (got 2 years for price of 1 deal they had at the time). I have noticed performance has been all over the place for the last few months. Some days I can max out my 20Mbps ADSL2 and others I get around 5Mbps even though my native ADSL2 connection can still achieve 20Mbps on speedtest.net. That said my primary use is US Netflix & BBC streaming and I have not had any buffer issues to date. I tend to use Netherlands or Switzerland if I want privacy and quite often if the connection is up for a long time it just seem to block up and no traffic will flow and I have to disconnect and reconnect. I am on a Mac and their Mac app is crap, I have to use native OSX VPN profiles I created for each Country and don't bother with the app. Thank you for such a great reviews of PureVPN. I want to share the all reviews which are mentioned here are old. For those users who are looking for latest review feel free to read it from this review of PureVPN.